This was not the weather morning we were expecting. We got to the wildlife management area shortly after sunrise to find that the air was still and dense with no sign of the promised sunshine. 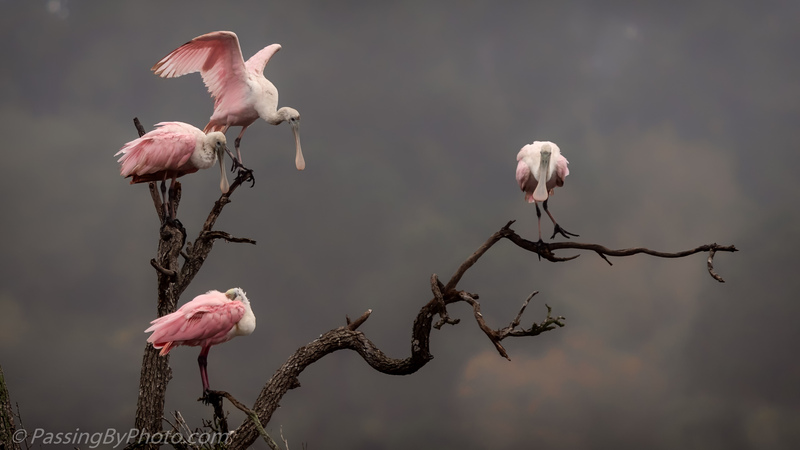 However there were a few Spoonbills in the spoonie tree so you know I took some images. I thought this one was going to land on the left branch but he kept going to one that was already occupied. 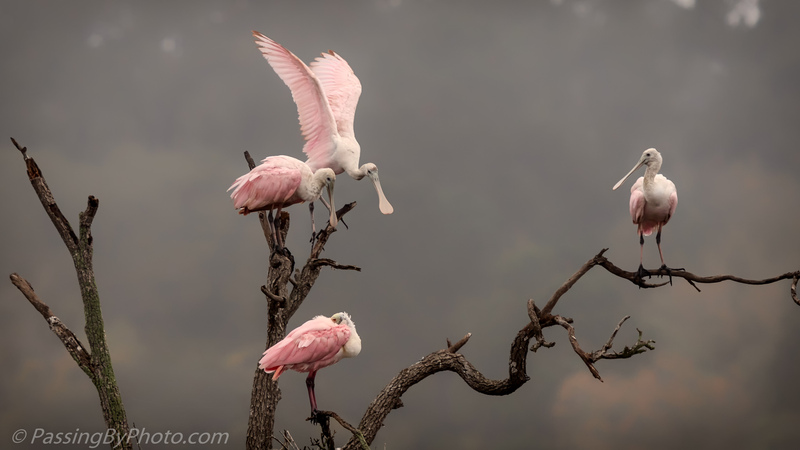 The two Spoonbills on the left took no notice of his arrival. Wow. 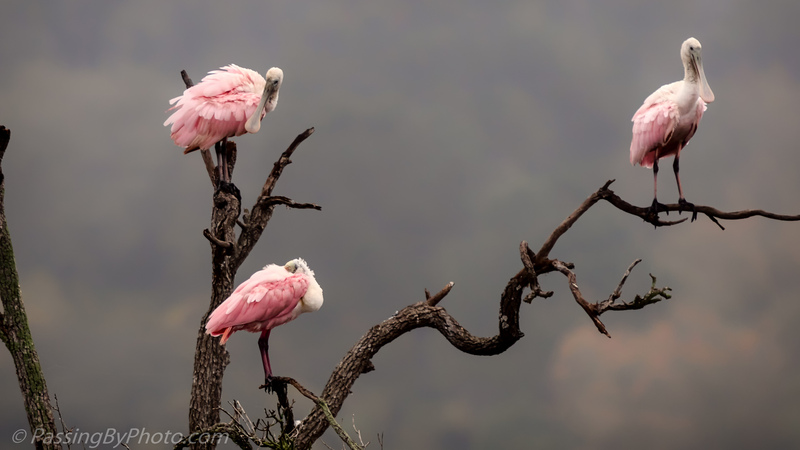 The pink color of those spoonbills never ceases to amaze me. I definitely need to see them in person. 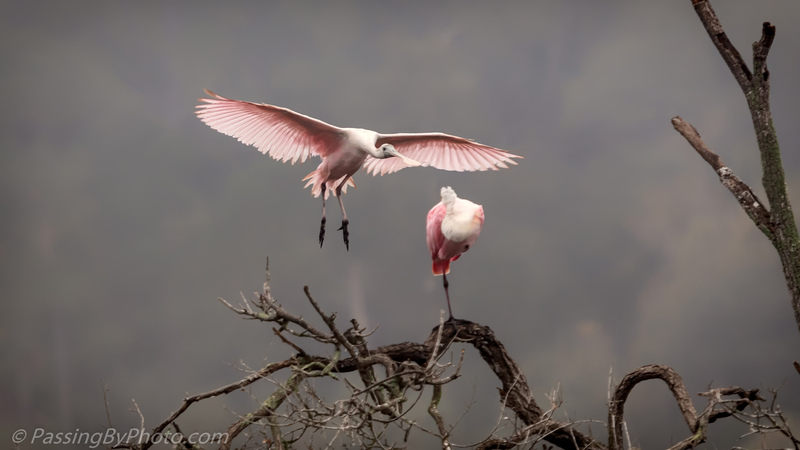 I love the action shots and the way that they show the indifference of the other birds to the arrival of another one. It really is something, Mike, and I’m sure you’ll love it! Watching the behaviors of the wading birds and a chance at action images is part of what keeps me going back. I think the dark background made it more dramatic. Love it. Thanks, Maralee! Glad that you liked it. Bird behaviour, go figure😏. Lovely shots of the birds against the pearl grey background. Just when you think you have them figured out… Thanks, Belinda, Glad I was able to turn that dark day into something good.